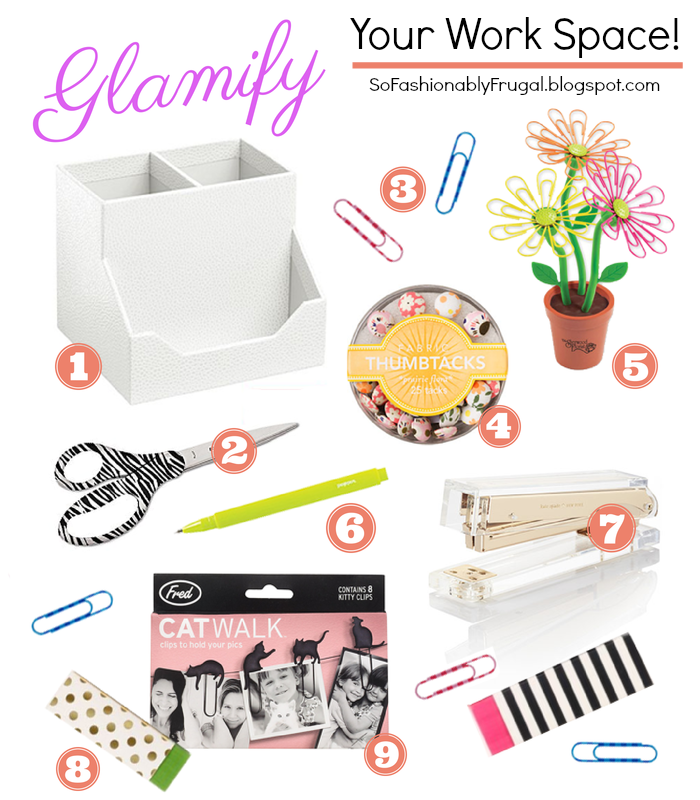 So Fashionably Frugal: Glamify Your Work Space! Our work-space is kind of our own little haven. Even if it's an area where we just sit on the computer; we still decorate it with a pencil cup and some Post-It notes. But did you ever realize that you could decorate it and make it less...well...like a cubicle? I've recently been updating my own desk with fun things to keep me inspired, while I blog on my laptop. It might sound silly but having a really fun desk can completely change how you feel about sitting there. So today I've compiled some of my favorite tips to help "Glam-ify" the workspace you already have! No need to buy a new desk or lamp. Ready? 1) Do It Yourself - Probably the easiest way to update anything in your home is by doing it yourself. So if you really hate say, the cork board in your desk area...and plan on throwing it out....reconsider! Pinterest is a dictionary of great tutorials. That simple cork board could look amazing covered in a fun fabric or a coat of white paint. Plus, when you get compliments on it you can say you made it yourself! So remember...before you say goodbye to anything on your desk for good, keep this in mind! 2) Color Is Everything - A lot of desks are usually decorated pretty uniform. As in silver accessories, normal pencils and boring pens. Adding something as simple as a pop of color to your work space can make it a lot more interesting! You can choose one large item like a vase to hold some flowers, or a bunch of small items like a collection of bright pens, post-its or a some colorful tacks for your pin board. And if you're really up for it you could take that lonely wood chair sitting in your garage, paint it a bright color and replace it with your computer chair. 2) Pay Attention To Texture - Textured items are the more subtle way to add some oomph to your desk. Think hammered metal, leather or a rustic wood frame for your photos. My favorite place to find some of these little treasures is at TJMaxx or HomeGoods. I've found some really unique items for my desk...including a black leather frame for $3! 3) Add a Whimsical Touch - Life can be really stressful, and because of that it's necessary to keep something fun on your desk. Just looking over at it and smiling can be enough to alleviate the daily stress. This can be something as simple as some crazy scissors or a fun tape dispenser. It can also be something really unique, like a vintage phone! Hope I helped some of you guys improve your work spaces! Let me know if you'd like more posts like this in the future! Have a great week!